According to Dr Chris Reidy (2015) the great transition will emerge as a sudden awakening from a series of major crisis, which translates as inspiration for the mass to get creative, become proactive, collaborative and cooperative towards a sustainable future or what we call the great transition. 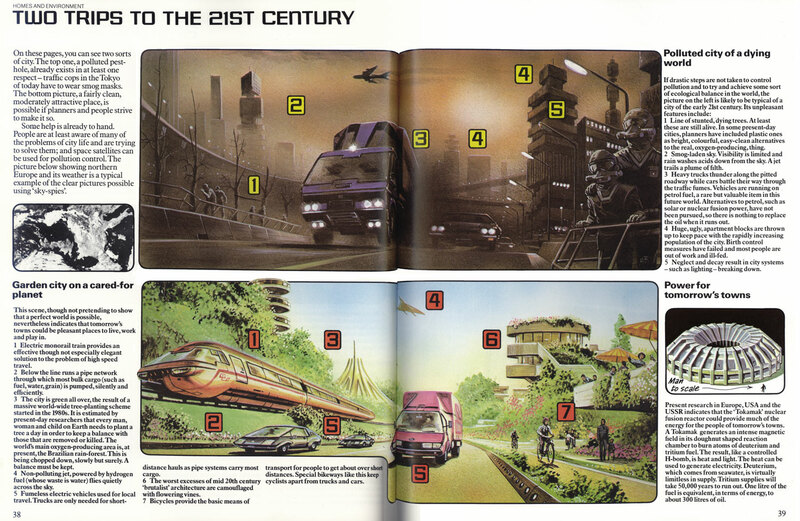 From The Usborne Book of the Future (1979) the Two Trips to the 21st Century illustration highlights the authors’ predictions of home and environment in the year 2000. It is important to note the contrasting images and prediction for a dystopian and a utopian future, the images together sparks self-reflection and creates a sense of choice to the audience. It is critical for us to visualise not only what the popular culture portrays, which are consequences of our destructive actions, but also the complementary situation and that is a sustainable future. For a sustainable future to happen, it would mean that all living things would co-exist together harmoniously, where production of meat, vegetables and all other produce becomes naturalised. Mass production of food made possible through the use of stimulant, harmful chemicals, hormones and other additive will be eliminated. Jamais Cascio argues that we have to recognise that we do not exist in this world on isolation and that in reality we depend upon a complex system. In order to survive, we have to reduce actions that damage and disrupt the environment (Cascio 2008). Initially a stronger relationship between humans and animals is crucial for a cared-for planet, both parties would have to rely on each other for survival. Founder of a new approach to animal welfare, Caroline Ingraham has achieved a solid connection with every animal under her care. Ingraham gives domestic and captive animals the chance to ‘self-medicate”. She acts as a guide to let wounded animals heal themselves and by doing so she discovered incredible healing techniques that can be applied to different animals even humans. She gained in-depth understanding of organic or natural medication. By understanding animal self-medication behaviour and allowing domestic and wild animals have access to natural remedies they need, not only will lead to new medical discoveries and prevention of epidemics but also further extends to domestic livestock benefits. In a simple scenario, when animals are given the option to self-medicate, farmers will no longer have to rely on costly antibiotics giving farming industry billions of saving, which then pass these savings onto the consumers. For the past few years the organic movement has been productive and became a motivation to consumers to eat and live healthily, with minimised dependence on mass-produced food and products. Locally hand-made products and organic produce have gained massive amount of supporters. More people are encouraged to share their creativity and passion for natural produce. Going back to Reidy’s description of the great transition, we are now awakened by crisis we face today such as landfill overload and climate change, it inspire us to be creative and think about our daily actions.